The team Dobra Zagrebancija (Tudor Musat, Miloš Marjanović; Cambridge/Belgrade) has won the Zagreb Open 2019. Out of Opening Government, they defeated Young, scappy and always hungry (Miri Muntean, Katrin Fallmann; Vienna) in Opening Opposition, Žižek (Matija Pušnik, Rok Hafner; Ljubljana) in Closing Government and Klatwa Czekana (Klaudia Maciejewska, Krzysztof Jaroń; Warsaw/Wroclaw) in Closing Opposition on the motion “This house believes that Marx would (have) approve(d) the internet“. The final was judged by a panel of Lovro Šprem (chair), Tin Puljić, Roel Becker, Teodora Rešetar and Franjo Jurkin. 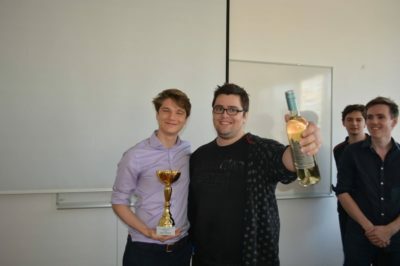 Best speakers of the tournament were also Tudor Musat and Miloš Marjanović with both averaging 82.2 speaker points. Roel Becker, Monica Forman, Franjo Jurkin, Maciej Lulewitcz, Ela Jurko, Tin Puljić, Teodora Rešetar and Lovro Šprem. The tournament featured 32 teams and was organised by the Zagreb Student Debate Forum with Ela Jurko and Luka Baković acting as head conveners. Responsible for the debating part were the chief adjudicators Tin Puljić, Monica Forman and Roel Becker with Luka Baković also being responsible for the tab. *Status given to an employee indicating that the position or emplyoment is permanent. SF: Infoslide: Syrian ruler Bashar al-Assad has been heavily pressuring the Kurds in Syria to hand over the territory they control, and has presented them with two possibilities: Reconciliation with the regime and the promise of autonomous rights, or the use of force against them.